The first design assignment for the students of the Master in Advanced Architecture 2013 was to develop and test communication protocols to control and manipulate the behavior of a large industrial robot. Since 6-axis machines such as the one in the IAAC Fab Lab are directly inherited from the mass production of cars and other industrial products, the first focus of our design research has been devoted to developing alternative protocols of robotic fabrication that would afford a more direct interaction between machine and designer, as well as machine and the surrounding environment; these protocols will lead to the engineering of mass customized productions. -The robot was controlled by each student via Grasshopper, through the use of the KUKA | Krc plug-in (from association for robots in architecture) for Grasshopper and Rhino. Each group did draw a series of parametric lines that would become the tool paths for the robot. -A video simulation with the virtual robot in Grasshopper was performed by each student to understand the behaviour of the machine along the path and amend eventual errors; the video would allow also the testing of multiple path parameters and robot behavioural options. -The tool mounted on the robot contained 1 fixed LED light and 2 or 4 blinking ones; the blinking was also controlled via Grasshopper and related to the robotic arm path. -A camera was positioned in front of the robot and its exposure tuned to the particular lighting conditions and the length in time of the tool path. 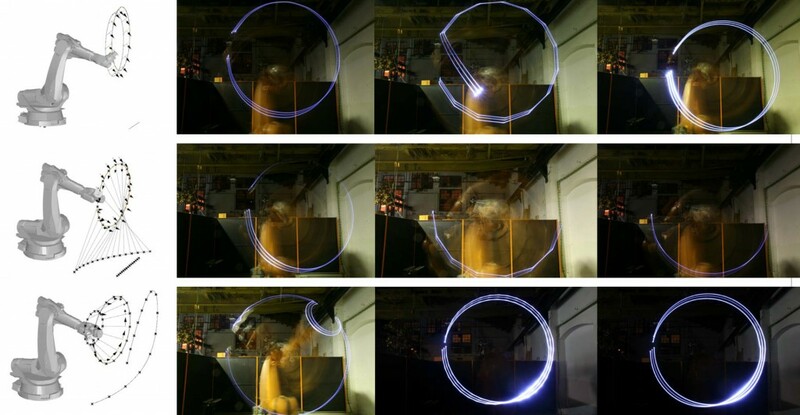 Such configuration allowed capturing the ephemeral lighting traces left by the robotic arm movements. 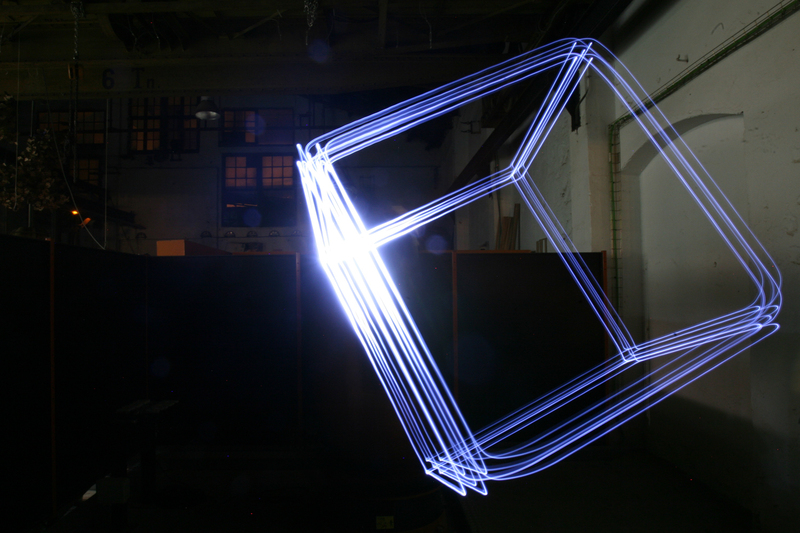 The robotic behaviour is therefore translated into a 3D robotic light painting.